If you’re thinking of building a new Sydney carport, style is probably high on your list of priorities and with good reason. A stylish carport – one that complements or perfectly matches your home – will be an asset for your family and a value-add when you decide to sell. In addition to style, another common priority, with most of us busy and time-poor, is the desire for a low maintenance lifestyle. So, the question is, is it possible to have a low maintenance Sydney carport that’s also stylish? Of course you can, particularly if you use Mr Carports. The key to low maintenance is, of course, to choose low maintenance materials and for this reason it’s generally best to steer clear of timber. While timber is a beautiful product and long lasting, it also needs to be protected to keep it in tip-top shape. So, any timber you use in your carport will need to be protected initially and maintained in the years and decades to come. When thinking low maintenance choose steel and/or aluminium. They’ll be a great option for your Sydney carport and for that matter any outdoor structure. Both can be used in all parts of your new carport, including the posts and other structural components, as well as the roofing, guttering and downpipes. They come pre-painted – so there’s no requirement for paint at all – and come in a wide range of colours. And the look? While it’s difficult to beat timber for aesthetics, steel and aluminium have certainly improved in the looks department. From afar and even reasonably close up you probably won’t notice. You might think that there’s a price to pay for these low maintenance options, particularly in the bottom line, but that’s not necessarily the case. While steel and aluminium can cost more compared to some timbers, they’re often cheaper to use. That’s because many components are fabricated off-site, so are quicker to erect, reducing labour costs. Aluminium and steel are extremely strong. Both are resistant to weathering, rot and corrosion. Because of their strength, aluminium and steel structures can often allow for wider spans, so are perfect if you’re after a larger carport. To get cracking on your new Sydney carport, give Mr Carports a call on 1800 557 782. 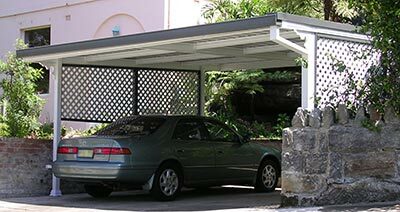 For more information on building a carport in Sydney, see our Sydney branch page.